In a neighboring parish, there was a little boy in bed, covered with sores, very ill and very miserable. I said to him, “My poor little child you are suffering very much.” He answered me, “No sir, today I do not feel the pain I had yesterday, and tomorrow I shall not suffer from the pain I have now.” 27 When the Good God sends us crosses, we resist, we complain, we murmur and we are so adverse to whatever contradicts us that we want to be always in a box of cotton, but we ought to be put into a box of thorns! It is by the C ross that we will go to Heaven. Illness, temptations and troubles are so many crosses which will take us to Heaven. The good God does not require of us the martyrdom of the body; He requires only the martyrdom of the heart and the will. Our Lord is our Model. Let us take up the cross and follow Him Who has gone before us. The cross is the ladder to Heaven! How sweet it is to die, when we have lived on the cross! We ought to run after crosses as the miser runs after money. Nothing but crosses will reassure us on the Day of Judgement. When this day shall come, we will be happy in our misfortunes, proud in our humiliations and rich in our sacrifices. If someone said to you, “I should like to become rich, what must I do?” You would answer him, you must labor. In order to get to Heaven, we must suffer! When we have no crosses, we are arid: if we bear our crosses with resignation, we feel a joy, a happiness and a sweetness ... it is the beginning of Heaven. The Cross gave peace to the world; it must bring peace to our hearts. All our miseries come from not loving the Cross. Fear of crosses increases them. Nothing makes us more like Our Lord than carrying His Cross. All pains are sweet when we suffer in union with Our Lord. The Cross is the gift that Our Lord makes to His friends. How beautiful it is to offer ourselves every morning in sacrifice to the Good God and to accept everything in expiation for our sins! We must never question from whence crosses come: They come from God! It is always God who is giving us this way of proving our love for Him. One of the greatest gifts in Heaven’s treasury, is an understanding of the Way of the Cross, a love for trials and sufferings. Ah, if we could just spend a week in Heaven, we should understand the value of our moments in suffering! 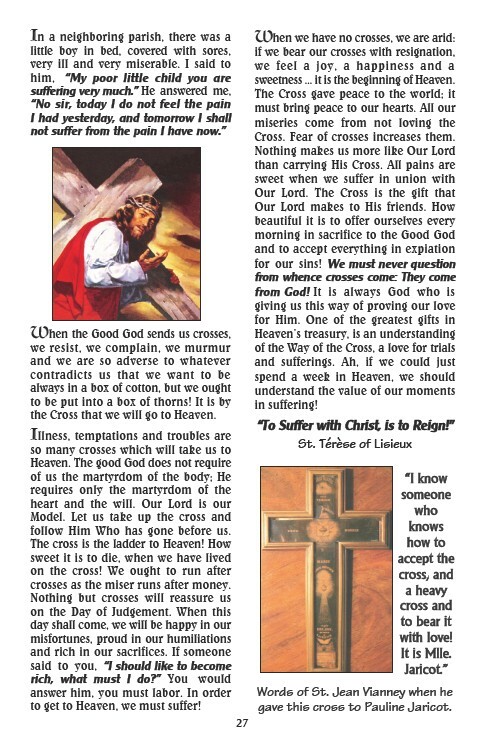 “To Suffer with Christ, is to Reign!” St. Térèse of Lisieux “I know someone who knows how to accept the cross, and a heavy cross and to bear it with love! It is Mlle. Jaricot.” Words of St. Jean Vianney when he gave this cross to Pauline Jaricot.